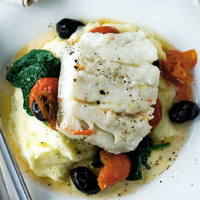 In South Africa, the fish of the day may well be kingklip or yellowtail, but in the UK use whatever is local – hake, cod, bream or salmon make tasty alternatives. This dish adds tomatoes and black olives, which are now widely grown in the Western Cape. For maximum impact, serve on mash with some lightly cooked spinach. Put the tomatoes in a small roasting pan, drizzle with the olive oil and add the garlic. Roast for 20 minutes, then add the olives. Move the mixture aside and add the fish fillets to the pan, skin-side down. Baste them with a little of the flavoured olive oil and roast for 12–15 minutes, depending on the thickness of the fillets, until just firm and flaking easily.